If you want to see where the populations of college towns are exploding with students and non-students alike, you need to follow the sun: Warm, sunny areas in the South and West dominate our list of America’s Fastest-Growing College Towns, mirroring a shift in overall population trends. 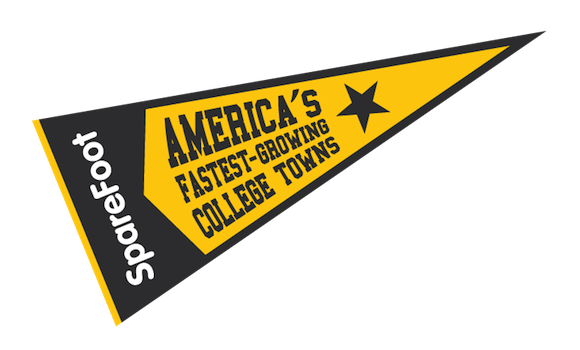 SpareFoot compared the 2000 and 2010 populations of college towns to rank the 20 fastest-growing college towns in America. 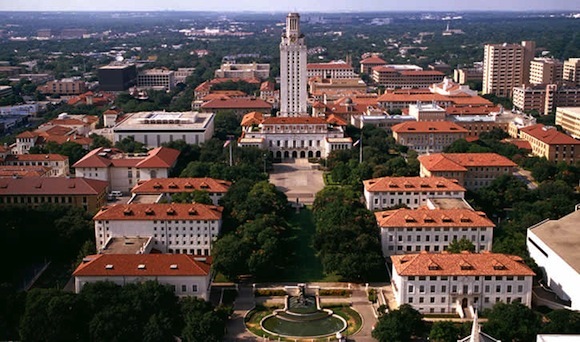 We selected only those towns with a main campus of a public four-year university and a city population bigger than 20,000; we didn’t include cities like Atlanta and Boston because although they’re home to major universities, their economies are more diversified than those of traditional college towns. 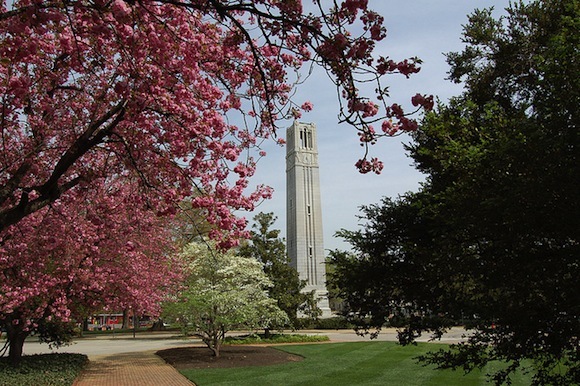 Here’s our list of America’s Fastest-Growing College Towns. 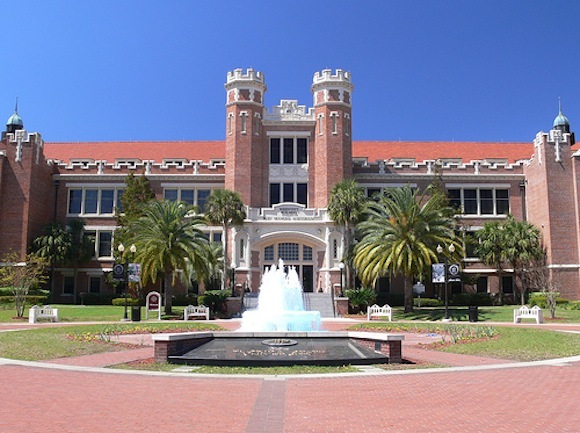 The University of Florida, one of the 10 largest universities in the country, is situated in sunny Gainesville. The north-central Florida city boasts lush greenery, from live oaks draped with Spanish moss to palm trees and dogwoods that bloom in spring. 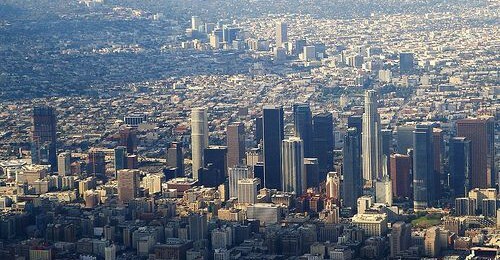 Downtown serves as a cultural center, with a pedestrian mall, a farmers’ market and a professional theater. Nearby Paynes Prairie, a 21,000-acre national landmark, is home to alligators, bison and more than 270 species of birds. The city is within two hours of Tampa, Jacksonville and Orlando. This central Texas city offers the best of two worlds: a bucolic feel with a population close to 50,000 and a location half an hour south of the cultural mecca of Austin. Nicknamed “San Marvelous” by locals, the city is crisscrossed by creeks and the San Marcos River, where outdoor enthusiasts canoe, tube and snorkel. Restored vintage glass-bottom boats offer tours with glimpses of sunfish, catfish and turtles, according to Aquarena Springs, a former water theme park now owned by the university. 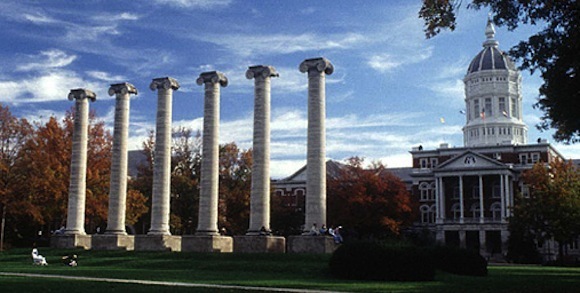 Columbia sits midway between Kansas City and St. Louis. Columbia’s city center, known as “The District,” boasts old brick buildings that house art galleries, theaters, bars, restaurants and shops. The city’s Missouri Theatre Center for the Arts, housed in an ornate 1928 building modeled after the Paris Opera House, hosts performing arts. Columbia also is a haven for nature lovers: Nearby Rock Bridge Memorial State Park features a cave system with natural tunnels, sinkholes and a chilly cave called the Devil’s Icebox. 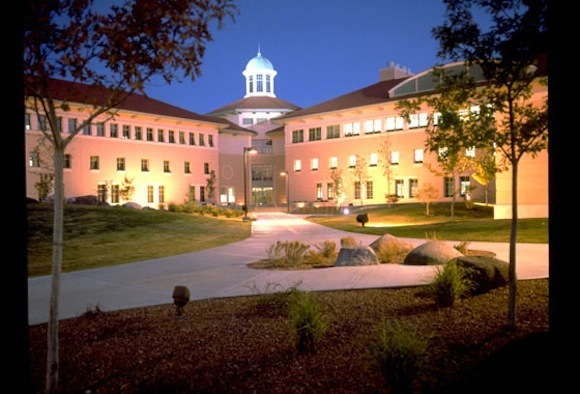 Flagstaff is a “quaint mountain town,” according to Northern Arizona University. The sun shines 300 days a year, but the winter snow keeps the Arizona Snowbowl ski resort in business. Surrounded by mountains and ponderosa pines, the area draws outdoor enthusiasts, from trail runners to mountain climbers. For walkers, runners and bikers, the city features 50 miles of urban trails that cross landscapes ranging from Route 66 to grasslands and forests. Flagstaff is home to the world-famous Lowell Observatory as well as music, book and film festivals. It sits about an hour and a half north of the Grand Canyon. 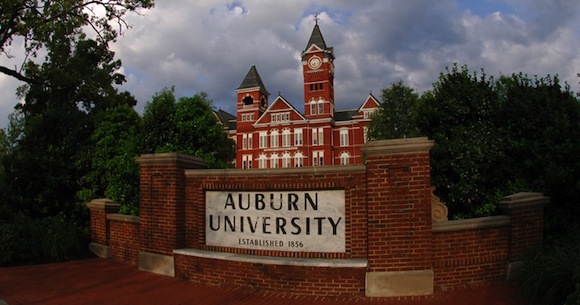 The city of Auburn revolves around Auburn University, a major research institution. Sports aficionados with a strong sense of tradition fit in well: Auburn University football dates back to 1892, and devout Tigers fans flock from all over the region for home games, which average 87,000 attendees. City landmark Toomer’s Drugs, a pharmacy that’s been around almost as long as the football team, serves a legendary fresh-squeezed lemonade that is “what God drinks on game days,” according to Southern Living magazine. University of Maryland students who want to witness federal politics up close can hop on the subway for a quick ride to the nation’s capital. 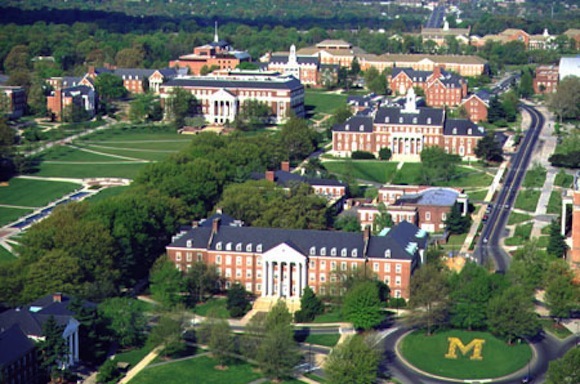 According to U.S. News & World Report, the University of Maryland is a “commuter school.” College Park officially became a city in 1945, but its history dates back to colonial times. The Rossborough Inn–the oldest building in the area, dating back to the late 1700s–now houses a “quaint” restaurant that serves lunch on campus. Located near the Rocky Mountains and on the Cache La Poudre River, sunny Fort Collins is a popular spot for outdoors lovers. Locals enjoy a thriving bike community that includes the Fort Collins Bike Library, which provides free loaner bikes to residents, students and visitors. Self-guided tours put together by the bike library include an ecological tour, a historical tour and a microbrewery tour. 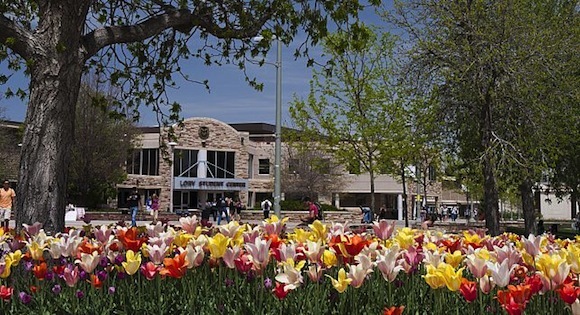 The local performing arts scene features the Fort Collins Symphony, Opera Fort Collins and the Canyon Concert Ballet. For locals craving a big-city experience, Denver is just an hour to the south. 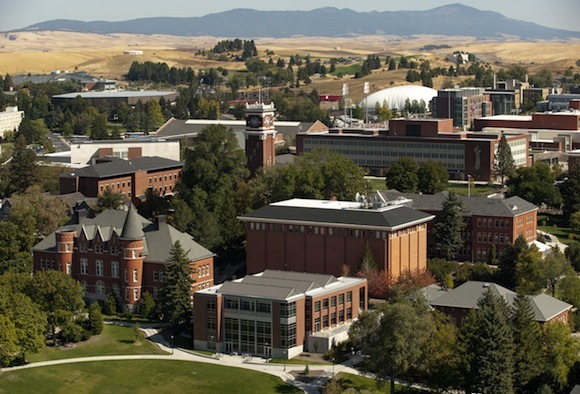 Pullman is a picturesque city with a fairly dry climate. 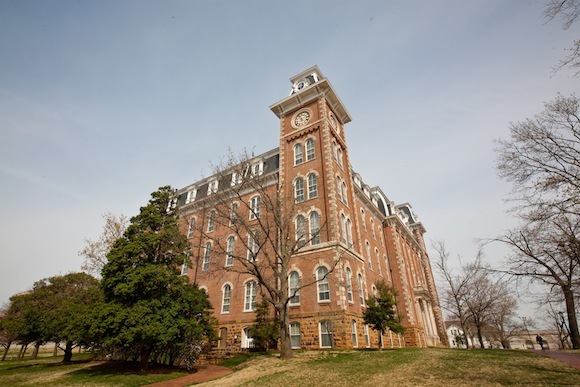 It’s built on four major hills: Military Hill, Pioneer Hill, Sunnyside Hill and historic College Hill, where the Washington State University campus stands. The city offers 17 parks and natural areas, and many outdoor activities, including boating on the Snake River, salmon fishing–and elk, moose and cougar hunting. On the rolling green farmland surrounding the city, lentils, chickpeas and wheat are grown. Legume lovers, take note: Each August, Pullman hosts the National Lentil Festival, which features a lentil cookoff. 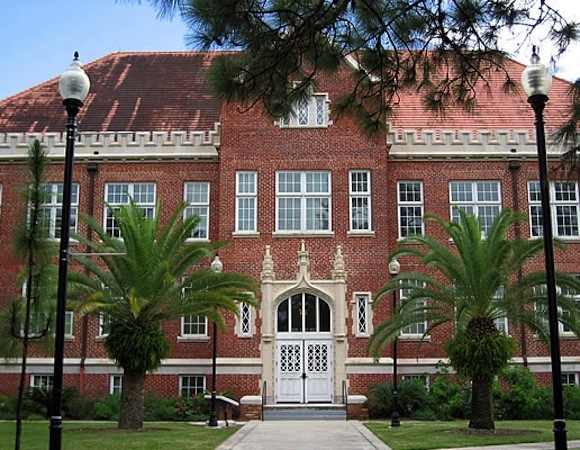 The capital of Florida, Tallahassee is filled with more than 50,000 students, from Florida State University and Florida A&M University. Located in the Florida Panhandle, Tallahassee’s weather often sizzles more than much of the rest of the state. 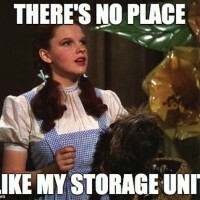 But the waters of the Gulf of Mexico and the white sand beaches of St. George Island are only an hour and a half away. The laid-back Southern city offers plenty of green space, including the 250-acre Tom Brown Park, which features a disc golf course, BMX tracks and a twisty mountain bike trail. Nearby nature preserves offer opportunities to spot alligators, turtles and birds. 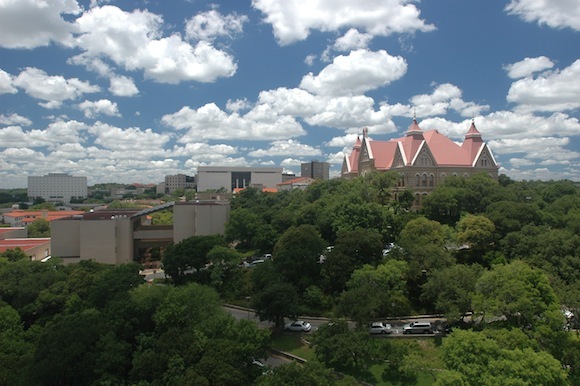 Famous for its live music scene, Austin often ranks as one of the coolest places to attend college. The South Congress and Second Street districts offer eclectic shops, restaurants and bars, and the Sixth Street District is practically a nonstop party. The city motto “Keep Austin Weird” is embodied in everything from zany yard art to Eeyore’s Birthday Party, an annual bash that features bongo drummers, hula hoopers and costumed revelers. Foodies and hungry students flock to local food trucks to sample everything from smoked macaroni and cheese to tempura shrimp tacos. Champaign and neighboring Urbana are part of the “Silicon Prairie,” a nickname that stems from the area’s startups and established tech companies. 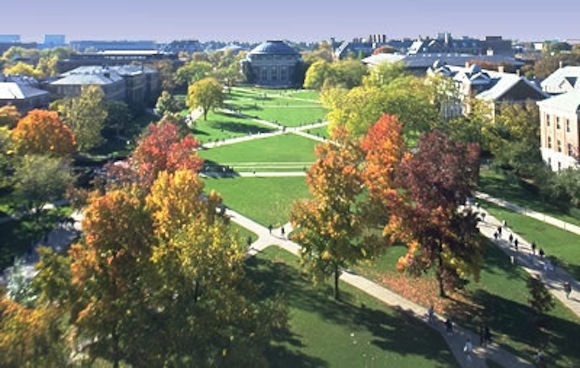 Champaign and Urbana–nicknamed “Chambana”–offer plenty to do: The university-owned Krannert Art Museum showcases pieces ranging from ancient Greek vases to computer-assisted art, and the Art Theater shows indie films. Surrounded by farms that grow corn, beans and hay, the twin cities are less than three hours from Chicago, Indianapolis and St. Louis. 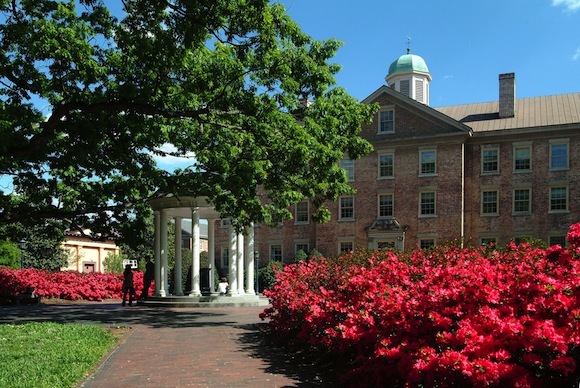 Chapel Hill provides a cozy feel within a metro area of nearly 2 million residents. When Bon Appetit named the city “America’s Foodiest Small Town,” the magazine praised local pimiento cheese sandwiches and peanut pie. Garden & Gun magazine calls Chapel Hill “the South’s most civilized town (except when it comes to basketball. )” On the court, the North Carolina Tar Heels’ ferocious rivalry with the Duke University Blue Devils is legendary. Just an hour outside Oklahoma City, Stillwater sits on the wide-open prairie in the heart of “Tornado Alley.” The city is known as “the original home of Red Dirt Music”—a sound influenced by bluegrass, country, folk and Americana, according to VisitStillwater.org. The city’s quaint downtown features boutiques, jewelry stores, restaurants and other shops. 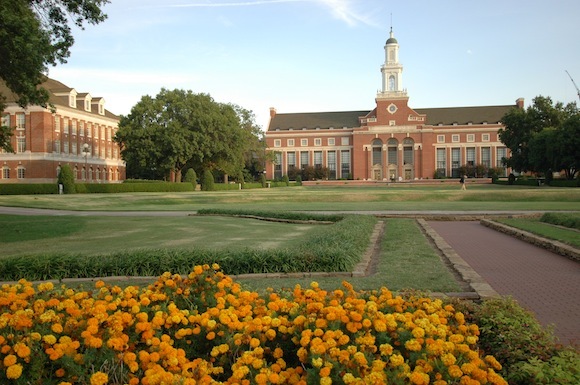 Local attractions include the university’s Oklahoma Botanical Garden & Arboretum and the National Wrestling Hall of Fame and Museum. 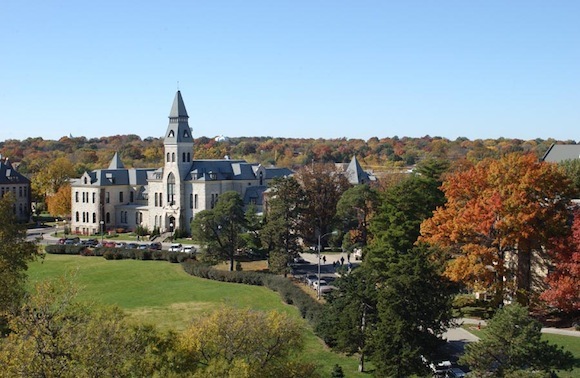 Situated in the picturesque Flint Hills region of Kansas, Manhattan is a cultural center dominated by the university. It hosts the annual Kicker Country Stampede, a four-day music festival that draws thousands of fans to Tuttle Creek State Park to catch stars like Toby Keith, Kenny Chesney and Lady Antebellum. 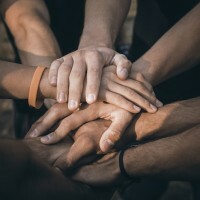 It’s a great place to settle after graduation, too: In 2011, Forbes ranked Manhattan the best small community for starting a business and a career. Fargo is the biggest city in the sparsely populated state of North Dakota. The Fargo Theater–a fully restored 1926 art deco cinema–shows arthouse movies and hosts the annual Fargo Film Festival. 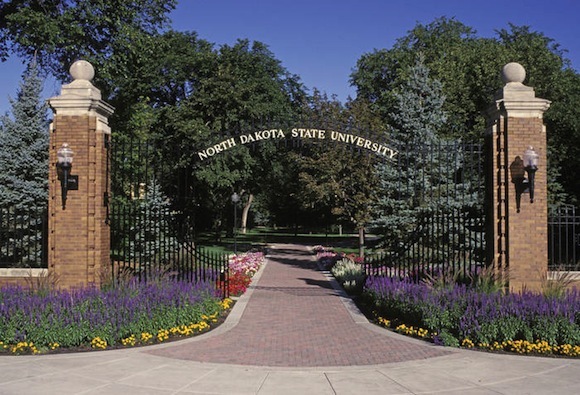 For sports enthusiasts, Fargo offers golf courses, a baseball field and an annual marathon. North Dakota has experienced a population boom in recent years, thanks in large part to oil and gas exploration. 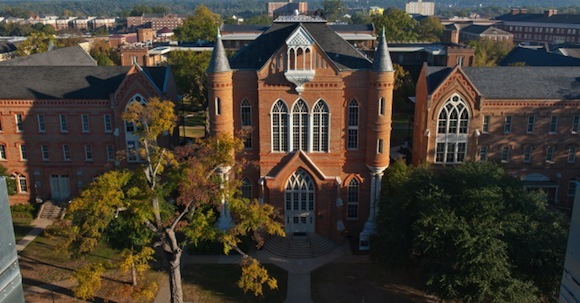 Tuscaloosa is known for its quality of life and rich history. 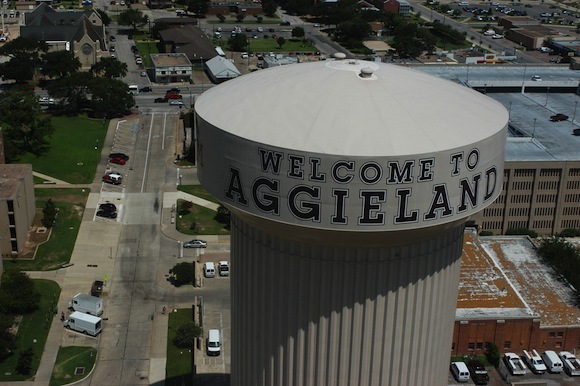 The city played an important role in the civil rights movement in the 1960s when two black students enrolled at the university, despite riots by white students. Today, the city rallies around the university’s Alabama Crimson Tide football team and offers a variety of arts, culture and outdoor activities. 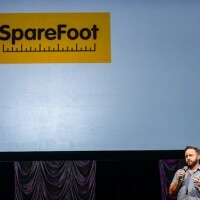 Products ranging from tires to electronics are made there, and the city has been singled out for its livability and business-friendly environment. Allie Johnson contributed information for this story.